All animals will die, this is an inevitable part of the cycle of life. 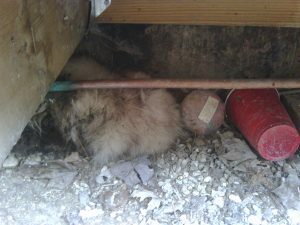 Remember the animal that is living in your attic, chimney or crawlspace or under your stoop, shed or deck will eventually perish. When wildlife dies, it is usually discovered by the foul odor that is created by the gases produced by the decaying body. If the animal is not in plain sight, it can be challenging to locate the source of the smell. Customers describe a dead animal smell as many things such as; sewer gas, bad cheese, moldy odor, barn-like smell, meat that has gone bad (which it is), smell of burning rubber, etc. When a skunk dies, the resulting odor is a sour skunk smell that will last for weeks to months. 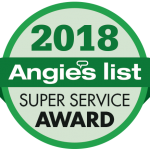 If you suspect that an animal has died in or near your home, there is no one better to call for dead animal removal and dead deer removal than Animal Control Specialists. We will quickly identify the source of the dead animal smell and quickly remove the carcass from your home. Where is the dead animal smell coming from? The location of a dead animal can vary widely. Some animals get stuck in wall voids, where will you likely hear scratching in the wall for a couple of days, then two to four days of silence, followed by the beginning of a foul odor. Many wild animals will crawl into the darkest, most difficult areas before they die. The smell of a decaying carcass is often much worse inside the house even when the body is actually outside of the structure. A bad smell inside the house doesn’t always mean that is where the source will be found. Air currents and pressure differences can result in the gases permeating the home when the animal is against or near the foundation wall. Callers regularly assume that the source of the smell is in the attic, crawlspace, basement or ductwork when the actual source is somewhere outside. The inspection for a dead animal is often a process of elimination. Determining what species is possibly the cause and where it isn’t, is commonly where we begin when we get called for dead animal removal. How long does the smell from a dead animal last? The strength and duration of the odor given off by a decomposing animal is effected by many variables. 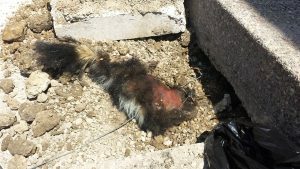 The size and species of animal can be the most impactful variable (especially if it is a dead skunk). Humidity, temperature, air currents, barometric pressure, building construction and the presence of parasites like flies all impact the severity of the problem. The smell of a dead mouse in a wall will dissipate on its own after 7 to 10 days. The stink from a larger dead animal like a raccoon or opossum (possum) will usually take weeks to vanish. How do we find the dead animal in our house? The dead animal removal process begins with locating the carcass. There is not a special tool that locates bad smells. We rely on our olfactory senses primarily. An animal that has died in a wall can be a challenge to locate. Experience, persistence, and knowledge of animal’s habits and how buildings are constructed all help guide us to a successful resolution to your problem. Removing the dead animal is only half the job, we will properly dispose of the animal by cremation. How will we get the dead animal out? Most people cannot live with a dead animal smell permeating their home. Animal Control Specialists, Inc has a trained and experienced staff that is very successful at locating and removing dead animals. The cost for our dead animal removal service is directly affected by the time and difficulty of finding and accessing the body. Some are very easy such as a dead skunk in the yard, or a dead animal in a window well, sump pump or pool. Some may be relatively easy to locate and access but its size can be the complicating factor, such as a dead deer in a pond or yard. We commonly need to cut holes in drywall, pry up deck boards, open soffits and dig under stoops and sheds to get to the carcass. Stoops that are under decks are one of the more difficult to get at. 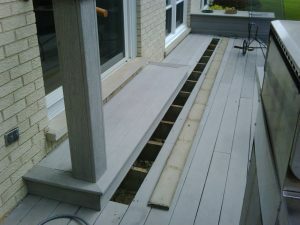 On rare occasion, we have removed sections of concrete walkways and patios in order to expose and remove the animal. Is any additional treatment necessary? Removal of the source of a foul odor will often improve the issue quickly. Fresh air introduced to an enclosed space may be all that is required after the animal corpse has been taken away. For an additional charge a chemical deodorizer can also be applied. Occasionally, a treatment for flies, fleas, ticks, maggots and other parasitic insects may be necessary. 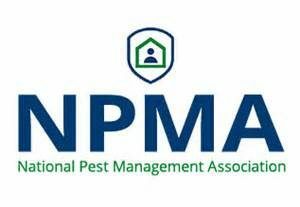 We are a licensed pest control company if additional pesticide treatments are required. What if I leave the dead animal alone? If the decay process is left to proceed on its own many unforeseen complications can arise. From staining of walls and ceilings to the insects that are attracted to the animal. Once flies find the body, they will lay eggs that hatch into maggots. The maggots will consume the flesh and then encase themselves in a cocoon-like shell. When they metamorphose into hundreds of flies that infiltrate your home, you will wish you had dealt with the problem earlier. The positive of this event is that the explosion of flies is the final stage of the process. Is there a dead deer on your property? Although deer can become disabled and die from various factors, most often it is due to being struck by an automobile. When a deer gets hit by a car it often suffers from internal injuries. 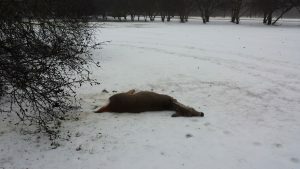 As a result of the injuries, the deer becomes weak and looks for a safe spot to lie down and rest. In many cases, the deer will die from it’s injuries in this spot. If you find a dead deer on your property, we do not recommend that you attempt to move it yourself. Deer are large animals and can be extremely heavy. There is also a risk of disease when handling a dead deer. Also, if left alone, the dead deer carcass will attract many unwanted critters including large birds and coyotes. Call us immediately for a dead deer removal quote if you notice one on or near your property. All animals will die. Disease, old age, starvation and injuries all contribute to the death of animals. Sometimes problems are created by well-meaning attempts to solve a wildlife problem. Wild animals are often locked inside houses by repairing their entry point while the animal(s) is still inside. Poisons are used by uninformed or malicious people that results in the death of wildlife whether unintentional or on purpose. We would always prefer to trap and remove a live animal rather that have to locate and access a dead one. Can future problems be prevented? Animal Control Specialists, Inc. will recommend physical barriers that will prevent future problems. We can install attic fan screens, roof vent screens, and chimney screens. We can also cover holes in roofs and gutter lines to prevent wildlife from gaining access into attics. We screen stoops decks and sheds to stop burrowing wildlife from living and dying under them. Call us today for removal of dead birds, squirrels, raccoons, possums (opossums), skunks, rabbits, coyotes, fox, deer and rodents. If you see a dead deer or other animal on or around your property, contact us before other wildlife take notice of the carcass. We can provide you with a dead animal removal cost estimate immediately. Do you have a WILDLIFE EMERGENCY? We're ready to help.